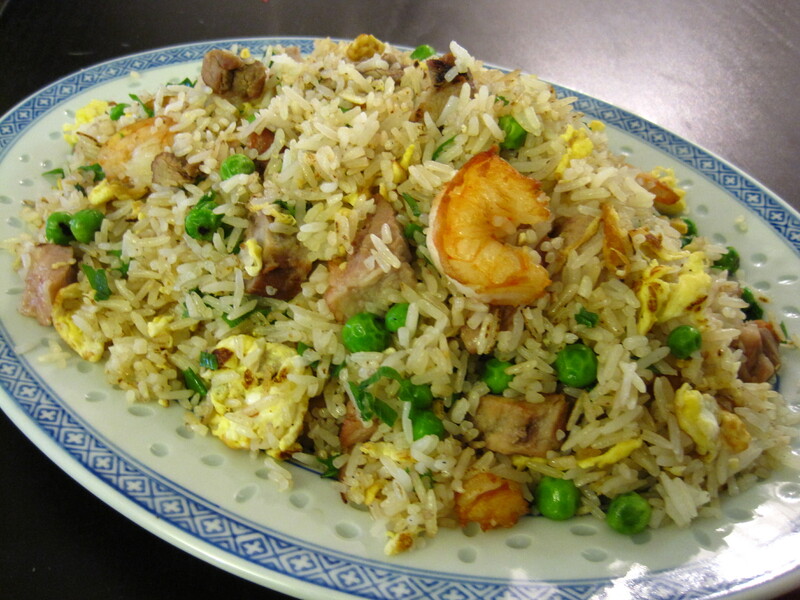 This is Ed’s favourite fried rice dish, so we order it often but it’s really simple to make. Note that fried rice is always supposed to be made with day old rice, because the moisture from fresh rice may result in a mushy dish. In some restaurants, the rice is darkly coloured and in others, the rice is still white (my preference). You can adjust the soy sauce or dark soy sauce to your preference. Massage a small pinch of salt into the shrimp and set aside. Set aside. Heat the wok over high heat. When the wok is hot, add the oil and swirl the wok to coat the bottom half with oil. Add the shrimp and give it a few quick stirs until they have just turned pink on both sides. Then push them over to one side and pour the eggs into the bottom of the wok. Sprinkle the egg with a pinch of salt. The eggs will cook very quickly. Allow them to set for a few seconds, then break them up roughly with your spatula. Before the eggs have finished cooking, push them aside with the shrimp and add the bbq pork and rice to the wok. Mix everything together until well combined. Cook, stirring frequently, until the rice is heated through and add the peas. Give everything a few quick stirs until the peas are heated through and add the soy sauce (if using) and green onions. Stir until well combined, dish out, and serve immediately.